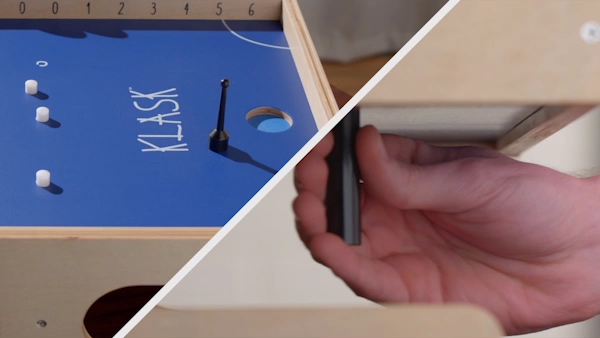 Klask: Frenzied magnetic tabletop game. 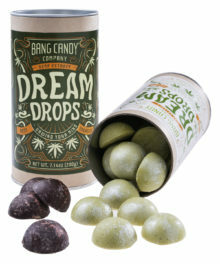 There's something awesome from the state of Denmark. 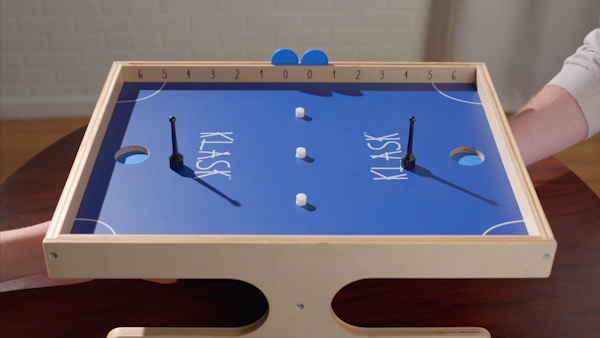 Klask is a fast-paced Danish skill game with an innovative control system. Your single pawn must both defend your goal and strike the ball into your opponent's. 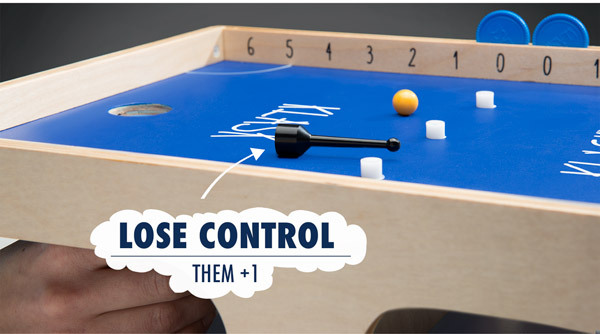 Control your pawn from under the tabletop game board using a magnetic handle. Oh, and to stay ahead, you've also got to avoid the magnetic obstacles on the playing field that will stick to your pawn if you get too close. 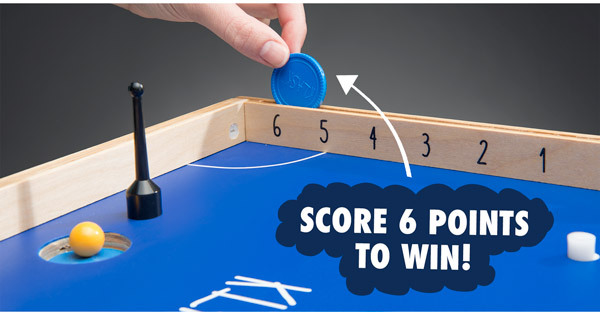 To score six points and claim victory, you'll need strong coordination and fast reflexes. 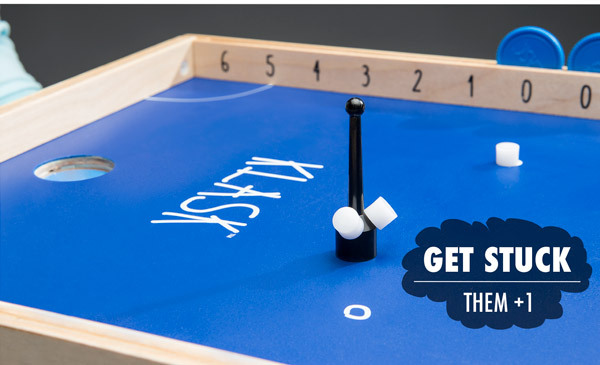 Klask builds on the excitement of foosball by giving you freedom of movement, combining fast-paced striking with strategic positioning to create a table top game in a league of its own. Use the magnetic handle under the table to control your striker above the table. 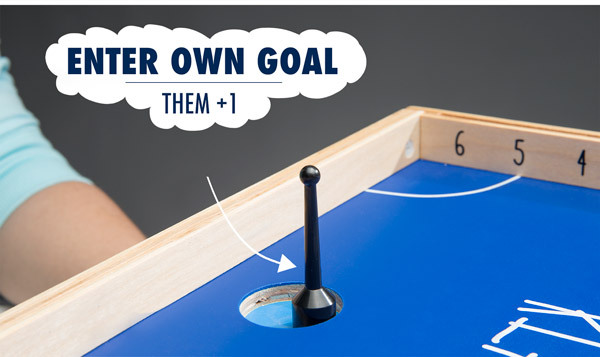 Score points by knocking the ball into your opponent's goal without falling into your own or getting bogged down by magnetic obstacles. 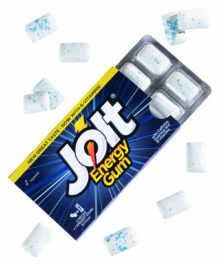 The most exciting sport you can play while sitting down. 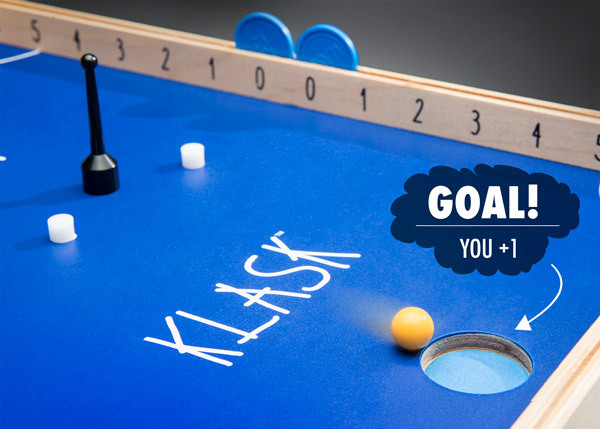 The rules of Klask are simple, but to be a champion, you must master total control. In addition to goal scoring, points are also accrued when one player makes a mistake. If your striker falls into your own goal, your opponent gains a point. If your striker accidentally picks up two (or all three) magnetic obstacles, your opponent scores a point. And if your striker loses magnetic contact with your handle, your opponent scores a point. 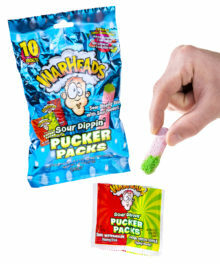 The first competitor to win six points wins the match! All that stands between you and victory is 6 points… and skill. Despite the finesse required to win in Klask, you never actually directly touch the ball or the striker. Instead, you manipulate an unattached handle under the board. A powerful rare earth magnet reaches through the playing surface and grabs onto the magnetic field of its companion inside your striker. Move your handle, and the striker follows suit. 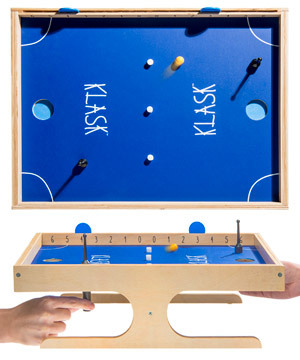 The complete Klask kit includes the board, two magnetic strikers, two magnetic handles, 4 defender magnets, 2 balls, and a pair of scoring discs. Get your game on; go play. 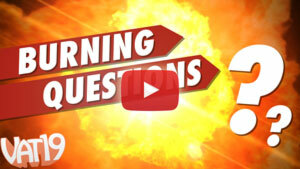 Question: How big is the playing area? Answer: The Klask board is approximately 14" x 18" with a height of 5 1/2". Question: What prevents you from accidentally knocking into the other player? Answer: The legs that lift the game off the table top also act as a partition, dividing the below-the-deck area in half at midfield.